I searched the blogs about camo that can be used, and i noticed that the recent camo pattern that i bought wasn't on the list. Its called Safariflage, it has green and tan color's in it, and i was just curious if i could use it. I mean, it looks pretty cool, but i figured I'd ask the masses before i wore it. its all about what the event organizer says, he/she says its allowed then ok but if they say no, then you cannot wear it. Looks like the upholstery on my grandmother's couch. I imagine the effect would be similar to this. That just made my day cigaro. As for the BDU, I think it would fall under the Muti-Cam so I think it might be reguarded as Tan but it is all up to the event orginizer. 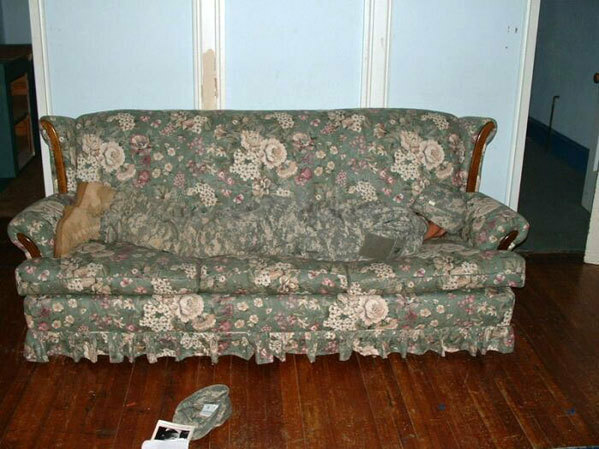 I just happened across that pic on a site yesterday and when Spectre made that comment I had to post it, now just waiting for someone to make the token "Urban camoflage" joke. Sorry to stray from topic but the Safariflage is...interesting to say the least. Why can't people stick to simple bdu patterns or solids like 3 color, 6 color, DESPAT, MARPAT, Woodland, Fleck, tigerstripe, and even DPM. These are incrediblely simple to ID at an event and won't cause the organizer and players headaches trying to figure out where they can be placed. What makes fleck or DPM a simple pattern but not safariflage? shouldn't this be in a thread? Well heck guys, we already move MARPAT, ACU Multi-cam and all the other BDUS around from team to team, who cares, if it isn't striaght up tan or green, the orginizers will put you where your needed. Sorry SOL I have to agree with Loc on this one, what is simple about Flektarn or DPM? Ware what ever you want bro, but bring extra BDUs just in case. Considering DPM is basically a slightly altered woodland, it is very distinguishable as being green. Fleck is also fairly easy to ID. Whereas this bdu has too much of a mix of green and tan. Like MC and XCamo. You're telling me DPM is hard to ID? SOL, I don't find any pattern hard to ID. Instead of trying to get people to wear certain BDUs, try and get better at identifying targets. The latter is much easier to control. I wear Desert Flecktarn because it's quite easy t identify as tan, but not alot of people have it. Loc, don't quite see why you have to make it personal. Anyway, when you can tell X-Camo from Multicam at a distance correctly 10 times without mixing them up then I'll reconsider. All the "universal" BDUs are all made with the same premise in mind, blend it with anything. Since more and more companies are hopping on the "universal" wagon then we will begin to see more and more patterns become seemingly more similar. But anyway. If you're looking at large scale events I.e. john lu events, only woodland and 3 color are allowed. Though I believe I saw one or two gentlemen in 6 color at NW5. Nothing personal there SoL. I am just telling you the truth. It is a skill you get better at over time.